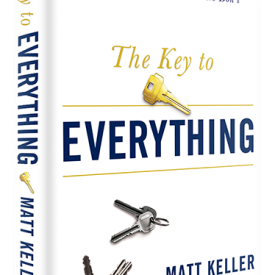 Matt Keller’s book, The Key to Everything sounds, by Matt’s own admission, like a very tall and unlikely order. Partially because Keller admitted this himself on the first page, I was intrigued to continue reading. As I did I learned that he may actually be onto something. As a physician, I have many employees who work as support staff as well as other medical providers. Interestingly, as I read I was unable to detach what Keller was saying in The Key to Everything from what I have experienced among my own employees over the years. Some of my most prized workers have one thing in particular in common—teachability. In Matt’s words, they were teachable. Although that sounds simplistic and naïve of me to make such a comment, believe me when I say, not everyone is teachable. After spending four years in college, four years in medical school, and another three years in internship and residency, I continue to have individuals who have had less than a semester of basic training that are unteachable. They have a better way to do things, no matter what. Under such circumstances, I will work with those individuals to determine if they can be trained (in Matt’s terminology—if they’re teachable). If they are incapable of learning, I not only find them a hindrance, I see them as dangerous to be around the practice of medicine. For the sake of my patients, I let them go to work where I’m sure they’ll tell someone else how to do things. As I mentioned, I spent a considerable number of years in medical training, and for quite some time I realized that I was unwilling to learn from anyone who had less training than I. Talk about audacious. Matt’s book truly spoke to this enough to make me uncomfortable (one of the first signs of being teachable). If we feel that we are experts in our field (and we very well may be) we get the mistaken impression that we can’t learn unless it comes from a higher source of training. Allow me to put that notion to rest. My mother and two of my sisters were licensed RN’s for many years. As I was about to begin medical school, they all gave me the same advice—find a nurse who knows what she’s doing, and, if she’s willing to teach (as most of them are) stick to her like glue and learn whatever you can. I know that their advice not only helped me get through the tough years of medical school—they also made me a better doctor because I was willing to be taught—willing to be teachable. That has never ended. Some of the most important information and techniques I have tucked under my belt over the last twenty years came from individuals with less training than I, but who knew what they were doing. Matt recommends in his book, The Key to Everything, that we take in the information he offers a little at a time and allow it to sink in—to change us. I strongly recommend this approach. If you’re like me you’ll want to forge ahead and read more of the truth’s he has to offer, but resist blazing through this book. Take a few days and let it change you—because it will. So what about Keller’s claim that his book holds The Key to Everything? Well, in a nutshell, it does. This is a must read if you’re a human. It’s that simple. I strongly recommend author Dennis Ricci’s blog on this book.